To check for a live conductor, the tip of the tester is inserted into the socket or placed near any other conductor under test. It is recommended to test all conductors, including the neutral, just in case there is a fault or incorrect wiring. Once the tester is placed near the live conductor, the electrostatic or magnetic fields induce a current that flows through the tester. This makes the device indicate the presence of a voltage by lighting up, making a sound or both. The non contact testing works for almost all live conductors including those covered by insulation. However, the tester cannot test through a metal shielding or conduit. There are two commonly used types of sensors; the capacitive coupled and inductively coupled testers. The inductive coupled tester comprises of a sensor winding at the tip. When this winding is placed within the electromagnetic field, a voltage is induced in the winding and used to light or sound an alarm though a circuit within the tester. A current will only creates an electromagnetic field if it is flowing. And since this tester works by detecting the magnetic field around conductors, it will only work in a if the conductor is part of a complete where current is flowing. As such, it will not indicate anything when there is an energized wire, but the circuit is not complete. The tester uses capacitor coupling to detect an electric field and is capable of detecting energized conductors whether in a complete circuit or not. For the tester to work, the person must touch the metal part of the tester so as to provide a ground reference and allow the stray capacitance from the live conductor to flow to the ground. Placing the tester near a live conductor forms a capacitive voltage divider network. This comprises of the parasitic capacitance between the sensor tip and the live conductor, and the capacitance between the sensor and the ground through the body of the user. Once the current flows to the ground, the tester will indicate the presence of the voltage through the light or sound. The testers cannot work with DC voltages since the capacitors and transformers do not work with DC. The non contact voltage testers have limitations and do not actually measure the amount of voltage present. Instead, they only indicate the presence of an energized conductor, which may require further investigation, and precaution. The non-contact tester voltage makes sure the power is cut off, and there’s no need to touch any wires. It is the safest way to do so. This is important in ensuring that power to the equipment is off before opening it for maintenance or a repair. However, the testers cannot measure the amount of voltage and will only indicate the presence of an AC voltage. or copy this trackback: http://engineering.electrical-equipment.org/electrical-distribution/non-contact-ac-voltage-testers-work.html/trackback from your own site. Great article review for electrical voltage tester. 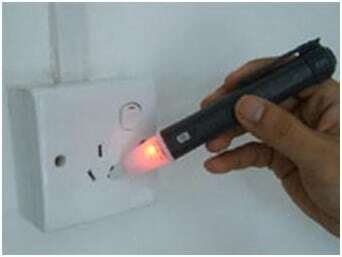 Voltage tester is a really safety electronic tools. Its get a better electric power protection. 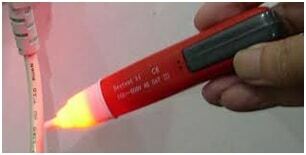 You can easily check your electricity using voltage tester. I have a voltage tester is very valuable tome. Is it possible to put a speaker on the circuit. which then sounds when a voltage is detected,t hen the frequency of the sound will be used to determine the value of voltage?